A quarter of low paid workers are permanently stuck in poorly paid jobs in the UK with little chance of earning more, according to new research. The Social Mobility Commission said low pay was "endemic" in the UK, with women more likely to get stuck on low pay. It found just one in six low paid workers had managed to escape from poorly paid jobs in the last decade. The report defines low pay as hourly earnings below two-thirds of the median hourly wage, which was £8.10 last year. The median hourly wage for an average person across the entire British workforce was £12.10 per hour in 2016, according to the report. "This lack of pay progress can have a huge scarring effect on people's lifetime living standards," Conor Darcy, a senior policy analyst with think tank Resolution Foundation, which carried out the research, said. He called for "a more comprehensive response from business and government" to help people earn more. On average, people stuck on low pay have seen their hourly wages rise by just 40p in real terms over the last decade, compared to a £4.83 pay rise for those who have permanently "escaped", said the report. The report found that low pay was a particular issue for women in their early 20s and said a lack of "good quality, flexible work" for those with child caring responsibilities was to blame. 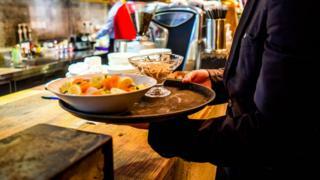 The industries with the lowest paid jobs are retail and hospitality, the report said. Although some employers in the hospitality and retail industries try to keep overheads down with low-paid jobs, Mr Darcy said this solution would not work in the long term, as employment costs are likely to go up. A Business Department spokesman said it had made progress on low pay: "We have more people in work than ever before, taken 1.3 million people out of income tax altogether since 2015 and the national living wage has delivered the fastest pay rise for the lowest earners in 20 years." A separate report from think tank IPPR said inequality was growing in the UK with young people particularly affected. It said the richest 10% of British households had an average of £1.32m in net property, pension and financial wealth. In contrast, the average wealth of the bottom 50% of households was £3,200, it said.